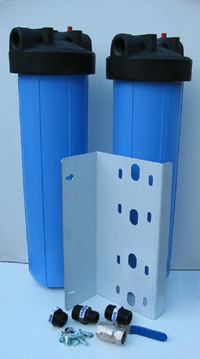 This system has two 20 inch x 4.5 inch Big Blue housings mounted on a stainless steel bracket. The first cartridge is a pleated (washable) cartridge for sediment reduction and the second is activated carbon for taste and odour reduction. The UV system is a 39 Watt Aquapro UV steriliser with a flow up to 54 lpm.